Mina Murray, a graduate and teacher at Miss Hadley’s School for Young Ladies of Accomplishment and fiancé to a promising young businessman, begins hearing voices, hallucinating and sleepwalking. Even more frightening she realizes that she’s being followed, perhaps stalked, by a well-dressed gentleman with seemingly good intentions. Not knowing how to handle the strange events, she goes on holiday to the coast with a close friend to await her upcoming nuptials away from the dark and dangerous streets of London. But, it seems, even stranger events begin to unfold in her supposed sanctuary. This book was not at all what I had expected–an eerie castle amidst a dark forest in Europe (thank Mr. Darcy, Vampyre for that), bats and coffins. No, the setting is England, with short jaunts in France and Ireland and to my complete surprise involved a sort of women’s rights theme with a sinister late Victorian insane asylum. The prose pulled me in right away and the descriptions are so tangible as to make the reader feel present in Mina’s world. 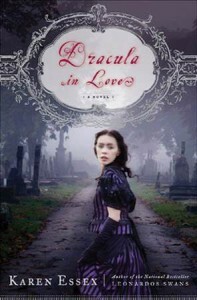 I must admit to having never read Dracula by Bram Stoker, nor am I much a reader of horror novels. Despite this I enjoyed the read and the material and characters were completely new to me because of my lack of reading history within the genre. From a historical lover’s standpoint, this novel fits right in with its descriptions of late Victorian England, especially on interesting points like photography (which was in its infancy), etiquette, boarding schools, women’s roles and psychiatry–not what you’re expecting from a book with Dracula, huh? Not overly sexual, yet sensual to the extreme, the vampires in this story have an interesting history and relation to ancient Irish myths. While Mina’s past is intriguing, I don’t feel there was enough explained about her relationship with Dracula… sequel perhaps? Or prequel, if you will.